Q: How do green plants manufacture their own food? In photosynthesis, a plant’s green leaves, fueled by sunlight, use water and carbon dioxide as raw materials to manufacture food (called carbohydrates) and oxygen. The leaf of a plant such as a tree or a shrub is a miniature factory, using fuel and raw materials to create food. A leaf captures solar energy by using a green photoreceptive pigment (a light-receiving chemical) called chlorophyll, which is embedded in light-gathering cells called chloroplasts, microscopic solar collectors. The leaf takes water from moisture that has been absorbed from the soil by the plant’s roots and delivered by vein-like structures. It takes carbon dioxide from the atmosphere, inhaling the gas through stomata, which are tiny specialized structures that compare with pores in skin. Summer sun shining down a desert willow, triggering photosynthesis. The leaf uses solar energy to trigger and fuel its manufacturing process, a two-stage, complex chemical reaction that converts water and carbon dioxide into carbohydrates and oxygen. When it's done, the leaf sends the carbohydrates through vein-like structures for delivery to its parent plant, which uses some of the food immediately to make new leaves, stems, roots, flowers and fruits. The plant also saves some of the food, in the form of potential energy, which it will use as needed to survive a desert drought or hard winter, or to grow in spring. The plant, as a producer, may also provide carbohydrates to animals, consumers, when they eat its leaves or fruits. Plants are the first link and the foundation for food chains. Meanwhile, the leaf expels oxygen  a byproduct of photosynthesis  through the stomata back out into the atmosphere. It becomes part of the air that animals breathe. The leaf's functions work best on clear warm days, when the sun’s light falls most intensely on its surface and absorbed water moves most freely through its tissues. Even on clear, warm days though, if its water supply fails, the leaf may not be able to complete photosynthesis. This is not an uncommon situation for a desert plant. Its parent plant must then shut down the production of carbohydrates and oxygen. Plants like the ocotillo, which grows in the Chihuahuan and Sonoran Deserts, shed their leaves to save water used in photosynthesis or wasted through transpiration. 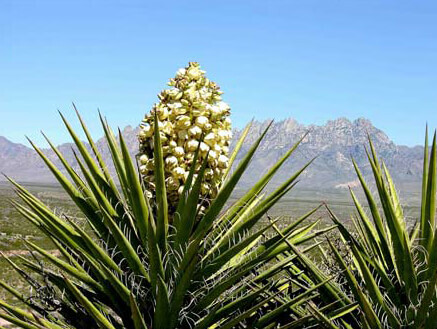 Torrey yucca, a succulent that closes its stomata during the heat of the day to conserve water, then opens them at night to take in carbon dioxide. When it has enough moisture, the leaf proceeds with the process of photosynthesis throughout the daylight hours. With the fall of darkness, it shuts down its solar collectors. It closes its stomata. It winds down the manufacturing process. It rests during the night. In the desert, where water is so scarce, some plants have adapted a water-saving modification to the process of photosynthesis. Most of these plants are succulents, agaves such as the century plant, which grows widely across the Southwestern deserts, or yuccas such as the Joshua tree, which grows in the Mojave Desert. Succulents are distinguished by waxy green leaves or stems with tissues designed for storing water. Unlike trees, which have leaves that open their stomata during the heat of desert days and close them during the cool of the night, the agaves and yuccas have leaves that close their stomata during the day and open them at night. The trees’ leaves take in carbon dioxide and expel oxygen and, wastefully, their water vapor during the hot day, as they carry out the process of photosynthesis. 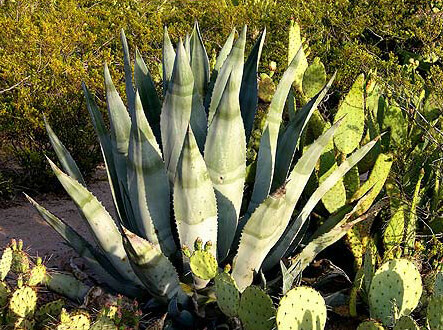 The thrifty agaves and yuccas, instead, take in  and chemically store in an organic acid  carbon dioxide and expel oxygen and water vapor at night. With dawn, when the sunlight becomes available as fuel, they close their stomata to minimize evaporation, release their carbon dioxide and proceed with photosynthesis. Agave (century plant) surrounded by a prickly pear cactus. Both plants are succulents that close their stomata during the day and open them at night. Cacti, such as prickly pear, cholla and barrell species, have developed another water-saving approach to the process of photosynthesis. It's not their leaves but their green stems that are equipped with stomata that open at night and close in the day. Otherwise they follow the same sequence of photosynthesis and respiration as the agaves and yuccas. Cacti leaves also serve as spines, which shield the plants from the desert sun and protect them from foraging animals. The leaves, or spines, have no stomata. While succulents have developed a way to conserve water, they are less efificent than other plants because they store and release carbon dioxide, an extra and energy-costly step. That means that succulents grow more slowly than other plants. 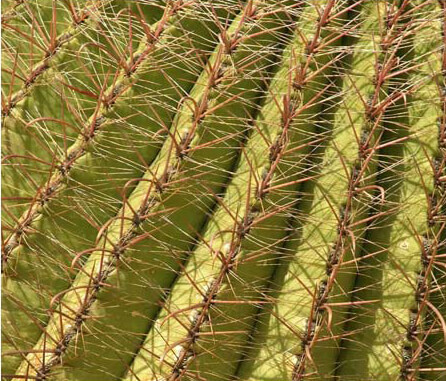 Closeup of the ribs and spines of a barrel cactus, a succulent that closes its stomata during the day, and opens them at night. The spines help shield the plant from the desert sun and protect it from foraging animals. During periods of intense drought, succulents may keep their stomata closed day and night to limit water loss, shutting down photosynthesis. At these times, scientists say the succulent is idling. When moisture does become available, succulents can open their stomata quickly, resuming photosynthesis again. The plants of Southwestern deserts don't change color in autumn. There is little color in the foliage of the region’s rocky and sandy basins. Many desert plants, such as creosote bush or cacti, that live for more than one season simply retain their chlorophyll and therefore the green color in their leaves or stems through the fall and winter, although they do throttle back on the process of photosynthesis during the shorter and cooler days. Other plants may simply shed their leaves for the cooler seasons, waiting for spring and new leaves before they resume the business of photosynthesis. Plants that live for only a season wither and die after a burst of photosynthesis, leaving behind an abundant seed bank but little color. Travel into the mountain ranges overlooking the deserts during the fall though, will reveal aspen, maple and oak trees turning into a kaleidoscope of colors. The mountain plants, sensitive to the shortening of the days and the coming of winter snows, shut down the process of photosynthesis for the season. The green chlorophyll breaks down. Its color fades. Other leaf pigments, yellow and orange, emerge. Simultaneously, other chemical changes within the fall foliage yield still more colors, displaying the full splendor of autumn. Plants and animals have an inseparable relationship, which is cemented by the process of photosynthesisperhaps the most important of all the biological processes. Plants produce carbohydrates. Animals consume carbohydrates. 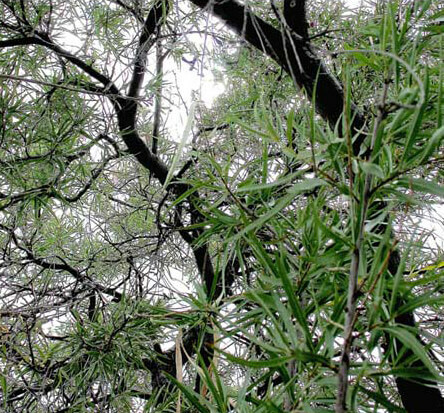 Plants take in carbon dioxide and expel oxygen. Animals inhale the oxygen and exhale the carbon dioxide. Plants and animals of the food chains depend on each other for life. How Do Green Plants Manufacture Their Own Food? How Do Desert Plants Survive? How Do Desert Animals Survive?